Potential residents considering real estate in Mozley Park will find that the area has many different opportunities for outdoor recreation. With the neighborhood being just over 3 miles from downtown, it is a popular area for those who commute to the city center each day. Mozley Park is well-suited for those who travel by car, given that it is situated just north of Interstate 20. Those who take public transportation will find plenty of options in the neighborhood as well, thanks to several Metropolitan Atlanta Rapid Transit Authority (MARTA) bus lines in the area. The low cost of living is another reason people are drawn to Mozley Park. Homes for sale are commonly sold for far less here than they are elsewhere in the city. With most homes being priced at $111 per square foot, potential residents can get a great deal on housing in the neighborhood. Rentals tend to be more affordable in Mozley Park, as well. 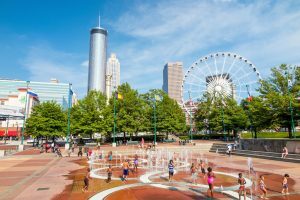 On average, rent is about $900 per month in the neighborhood, which is well below the average in Atlanta as a whole, where rates come closer to $2,000 monthly. Those looking for rental properties will find many different choices in Mozley Park, as about 55 percent of the people living here hold leases, rather than owning their residences. Apartments are not found within the neighborhood, which means that most people with leases in Mozley Park live in houses for rent by owner, instead. The people who call Mozley Park home make an average of $30,610 a year. While this is below-average compared to most places, many residents have some college experience. About 34 percent of the neighborhood has an associate degree or has completed a few years of college. Those with bachelor’s degrees, or higher, make up 26 percent of the neighborhood. When you buy or rent a house in Mozley Park, you will likely find that about one-third of your neighbors work in the service and sales industry. An equal number of people are employed as professionals, managers or executives. The remaining third work as clerks, assistants or laborers. With such an even split when it comes to profession, you can find people from all walks of life living next door to you. In their commutes to work, Mozley Park residents usually rely on cars. About 75 percent of the people living here drive to work, while 25 percent take the bus or train. With MARTA’s many bus stops in the neighborhood, it is easy to use public transport just about anywhere. The number 3 and 813 lines run through the neighborhood, providing quick access to downtown. Those who own homes in Mozley Park can also hop on the train at the nearby West Lake Transit Station, where the Blue Line passes through. With Mozley Park being close to many great schools, it is naturally a popular place for families to settle down. However, there are many single people in the neighborhood, as well. About 40 percent of people who own or rent houses here live alone. Regardless of whether a household has children or not, everyone should be aware of neighborhood safety statistics. Mozley Park is generally safe, but certain areas have a higher rate of crime than others. As in any neighborhood, residents should take measures to protect their homes and be aware of their surroundings in order to stay safe, regardless of where they live. Even with a moderate crime rate, Mozley Park is regarded as much safer than some of its bordering neighborhoods, such as Washington Park and Ashview Heights. One of the best parts of owning or renting property in Mozley Park is that the neighborhood is well-connected to great walking and biking trails. The neighborhood, itself, is not very walkable, in terms of running errands. However, the trail network provides excellent recreation opportunities. Walking paths that run through Mozley Park include Westview Path, the Lionel Hampton Trail and a portion of the Beltline, Atlanta’s main multi-use trail. While many sections of the Beltline are still under construction, Mozley Park residents can take advantage of a large stretch of completed trail that runs all the way to neighborhoods such as Pittsburgh and Capitol View. This also makes Mozley Park a very bikeable neighborhood, as the path is extremely popular among cyclists.